We’d love your help. Let us know what’s wrong with this preview of Perilous Question by Antonia Fraser. 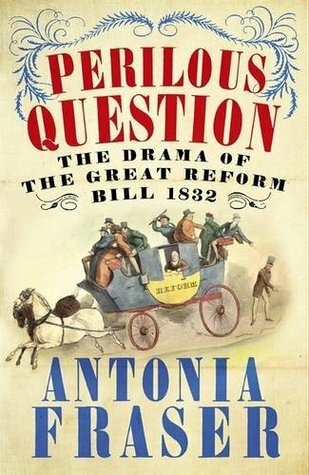 Antonia Fraser’s Perilous Question is a dazzling re-creation of the tempestuous two-year period in Britain’s history leading up to the passing of the Great Reform Bill in 1832, a narrative which at times reads like a political thriller. 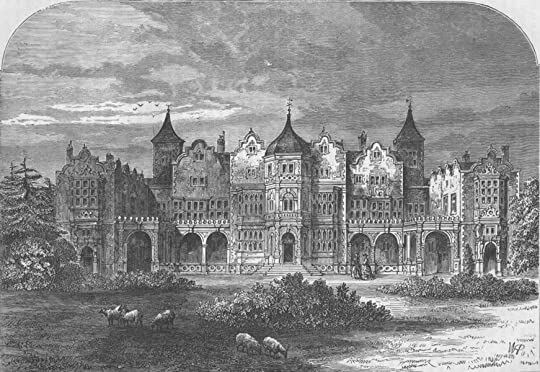 The era, beginning with the accession of William IV, is evoked in the novels of Trollope and Thackeray, and described by the young Charles Antonia Fraser’s Perilous Question is a dazzling re-creation of the tempestuous two-year period in Britain’s history leading up to the passing of the Great Reform Bill in 1832, a narrative which at times reads like a political thriller. The underlying grievance was the fate of the many disfranchised people. They were ignored by a medieval system of electoral representation that gave, for example, no votes to those who lived in the new industrial cities of Manchester, Leeds, Sheffield, and Birmingham, while allocating two parliamentary representatives to a village long since fallen into the sea and, most notoriously, Old Sarum, a green mound in a field. Lord John Russell, a Whig minister, said long afterwards that it was the only period when he genuinely felt popular revolution threatened the country. The Duke of Wellington declared intractably in November 1830 that “The beginning of reform is the beginning of revolution.” So it seemed that disaster must fall on the British Parliament, or the monarchy, or both. The question was: Could a rotten system reform itself in time? On June 7, 1832, the date of the extremely reluctant royal assent by William IV to the Great Reform Bill, it did. These events led to a total change in the way Britain was governed, and set the stage for its growth as the world’s most successful industrial power; admired, among other things, for its traditions of good governance—a two-year revolution that Antonia Fraser brings to vivid dramatic life. To ask other readers questions about Perilous Question, please sign up. 'The struggle for the Great Reform Bill of 1832 took place a the crossroads of English history.' - so says Antonia Fraser in her lively and insightful account of the political change that took place during this period. Times were in flux. The Industrial Revolution was underway. The reverberations of the French Revolution were still being felt. And the country would be ruled by a new monarch, William IV. Whigs - led by Earl Grey. and the word 'reform' is in the air. But who will press for it? BBC blurb: "The struggle for the Great Reform Bill of 1832 took place a the crossroads of English history." - so says Antonia Fraser in her lively and insightful account of the political change that took place during this period. And political change, who and how we would vote, was now in the spotlight. Put there mainly by the Whigs - led by Earl Grey. Age-old corruption, rotten boroughs, even hereditary peers would feel these winds of change. But how would the Bill be made law? Bumpily and dramatically, as it turned out, and its path is followed in five episodes, which are abridged by Katrin Williams. Reader Adrian Scarborough Producer Duncan Minshull. 1: It is the beginning of the 1830's. One king has died, another has been toppled, and the word 'reform' is in the air. But who will press for it? 2: The Whigs, led by Lord Grey, were the forerunners in pushing through Parliamentary reform. But who exactly were these men, and what was 'the committee'? 3: The bill to reform the voting system goes through the House of Commons but its passage in the Lords is spectacularly blocked. 4: Changes in the voting system are blocked by the House Of Lords, so anger and unrest spill onto the streets. The streets of Bristol, for instance. 5: After months of dramatic debate and hand-wringing, reform of Britain's voting system wins the day, and the bill becomes law. I pulled this previously unread book out of my library because I had just completed Nick Bunker's EMPIRE ON THE EDGE about how the British Government came to such grief over the American colonies in the 1770s. Part of that story had to do with the old and desperately in need of reform electoral structures of England at that time. Wanting to know more, I selected this volume and found that its discussion of institutional elites (of all political persuasions) vs. raging popular forces to be highly I pulled this previously unread book out of my library because I had just completed Nick Bunker's EMPIRE ON THE EDGE about how the British Government came to such grief over the American colonies in the 1770s. Part of that story had to do with the old and desperately in need of reform electoral structures of England at that time. Wanting to know more, I selected this volume and found that its discussion of institutional elites (of all political persuasions) vs. raging popular forces to be highly relevant to our current situation in 2018. (It also recalled for me another recent read, Mike Duncan's THE STORM BEFORE THE STORM about the political collapse of the Roman Republic). While Fraser does provide an account of the events of passing the "Great Reform Bill" 1830-1832, I found myself not liking the way that she does it. I have struggled to find a clean metaphor for how I felt trying to get through this book, and the closest that I have managed is that it felt like being driven down a windy country road at night, with things suddenly looming up out of the dark and then passing before I could understand what I was seeing. The central flaw of the book is that Fraser has produced an old fashioned chronicle, a recounting of events without any superstructure of interpretation, which is odd for someone who is a popular writer rather than an academic, but most academics I have encountered do a better job of contextualization. What the book needs more of is, and I hate to use this phrase but there really is no alternative, what is called "the big picture". She decides at the outset to primarily ground the account in people, so she spends just three pages discussing the many changes that had come over Britain between 1789 (the year of the French Revolution) and the death of King George IV (who had been the Regent for his mad father George III). She uses the change in ruler as the central inflection point, but what of other economic and social changes? She does not discuss the organization and nature of the political unions (such as the Birmingham Political Union led by Thomas Attwood) in any great depth, nor does she really address the rise of the middle-classes as part of this movement. Because the real story here is not (just) the one of Conservative vs. Reformer vs. Radicals, but also of the fact that so many people were now urban dwellers and not tenant farmers renting land from the Lords. Throughout, this is a work more centered on people than on broader social causes, and while I am not one of those who is *entirely* structural in their thinking - although some of my fellow social scientists are, structure does matter. In the end, Fraser does provide a summation that partially addresses broader context, but by then it is far too late. Had the book emanated from a more detailed overall picture, moreover, I suspect that its composition, with its constant changes of perspective even within particular paragraphs, would have flowed much better. I have read several historical fiction novels that left me wondering about the REAL grievance behind this Reform process, i.e., too many English folks who were "disfranchised people.” There were so many English people not included in voting just because of a medieval system, for example NO votes for the new industrial cities of Manchester, Leeds, Sheffield, and Birmingham, BUT two representatives for villages long since fallen into the sea and, most notoriously, Old Sarum. Antonia Fraser adds a little too much detail for me…Fraser presented the letters, speeches, and descriptions of so many Parliamentarians! Nevertheless, I skimmed it all to get a sense of the conflict. On June 7, 1832, after 2 years, the “extremely reluctant royal assent by William IV” was given to the Great Reform Bill…and it probably avoided a revolution that would have been a lot like France. The Reform Bill totally changed the way Britain was governed. But I won’t forget that there was still a lot of work to do…give the vote to non-land holders, to women, secret ballot, etc. Sprawling tale of change. Antonia Fraser describes the personalities and politics of the Great Reform Act in a enthralling manner with detailed assessment of the major players. This story of change driven by a divided elite is entertaining but never quite clarifies the reasoning for such a shift in culture. An excellent blow-by-blow account of the political battle for Reform. Interesting insight to the formation and practice of politics during the first half of the 19th century. In the early nineteenth century , parliament is a muddled affair; MP’s are not always clearly party aligned , and rotten boroughs prevail: old Sarum which consists of little more than a field has two MPs ; Yorkshire only one. Meanwhile , in the wake of the French Revolution, reform rears it’s head in England . Will this prevent revolution here or cause it.? It’s easy with nearly 200 years hindsight to be blasé about this question , but in the context of the time it’s a realistic moral dilemma , In the early nineteenth century , parliament is a muddled affair; MP’s are not always clearly party aligned , and rotten boroughs prevail: old Sarum which consists of little more than a field has two MPs ; Yorkshire only one. Meanwhile , in the wake of the French Revolution, reform rears it’s head in England . Will this prevent revolution here or cause it.? It’s easy with nearly 200 years hindsight to be blasé about this question , but in the context of the time it’s a realistic moral dilemma , albeit one that is swiftly answered by the riots ( and not just working class riots either ) that accompany the bill’s endless delays . This said , some of the ultra Tory opposition to reform , suffrage and the dreaded demonic word democracy can only be described as horrific and further cements my centrist convictions . Which isn’t to say that all Whig motive for reform was altruistic ; politics is always an uneasy mixture of public and self service . The borough reforms would benefit them a bit . Inevitably a book that centres essentially on parliamentary process is a bit dry in parts , notwithstanding the excitement of the riots and the final victory of the reform bill . There are heroes and villains : Lord Grey’s implacable and health-eroding commitment to reform and the Duke of Wellington’s contempt for it. Whilst Antonia Fraser is possibly more sure footed in the Stuart and Cromwellian era she makes a good fist of this; there is a good mixture of process and human detail. “The perilous question is that of parliamentary reform,” Fraser quotes Charles Grey saying in January 1831, “and as I approach it, the more I feel all its difficulty.” A history about British parliamentary reform sounds pretty dry. But the context in which the British parliamentary act of l832 makes it reasonably interesting. It was a period not far removed from the violent French Revolution of a generation before, and there were real fears of uncontrolled political violence shaking the foundati “The perilous question is that of parliamentary reform,” Fraser quotes Charles Grey saying in January 1831, “and as I approach it, the more I feel all its difficulty.” A history about British parliamentary reform sounds pretty dry. But the context in which the British parliamentary act of l832 makes it reasonably interesting. It was a period not far removed from the violent French Revolution of a generation before, and there were real fears of uncontrolled political violence shaking the foundations of British society. The issue was largely one of representation – three per cent of the population voted in l830, four hundred thousand people (males) out of a population of sixteen million. The Industrial revolution was underway and new industrial population centers such as Manchester and Birmingham were barely represented at all. Worse, the House of Lords was made up of aristocrats, some of whom came from “rotten boroughs” of practically non-existent constituencies. Given these abuses ( seen as such from our perspective nearly 200 years later), and the rising anger of the people that began to erupt in rioting, and with the specter of the French Revolution in the background, why would anyone oppose reform? First, the idea of the “rule of the people” was anathema in the early 19th century – the people just meant the “mob” and a vicious one at that. Members of Parliament, whether of the House of Commons or Lords, took pride in acting to insure social stability. Unlike the "mob", they considered themselves educated and responsible, always having the good of the country in mind, and not just narrow self-interests. The alternative was dangerous instability and experimentation. One step down that road and who knew what the results would be (I’m reminded, on a smaller scale, to be sure, of the debate today over implementation of Obamacare – opponents argue that it’s better to have a system that we know, rather than one that is unknown and potentially disastrous)? But open talk of civil war frightened leaders enough to propose legislation that would equalize representation in both houses of government, and the book takes up the various struggles and disputes between Tory and Whig leaders, as well as the government in which the king, William IV, played an important role. Grudgingly, and not without a lot of bitterness, a reform bill was finally passed, and a profound political crisis averted. Fraser paints the country as one on the verge of revolution. "The people", as contemporary prime minister Earl Grey* constantly put it, demand parliamentary reform. Rotten boroughs, constituencies like the (in)famous Old Sarum - a mere green mound, with its previous inhabitants long gone - can return two MPs to the Commons, while whole, growing, industrial cities such as Manchester and Birmingham struggle for even an ounce of fair representation. The Lords fight against the Commons, and can stop Commons legislation in its tracks, and so on, so forth. The system is portrayed as crooked - very close to total breakdown - and Fraser leads the reader through a story that is exciting, tense, and novel-worthy, as popular opinion, hastening towards utter social unrest, settles on Earl Grey and the Whigs' Reform Bill as the solution to current problems. It is a solution that, while not perfect, offers change, and positive change at that. It was, in short, as good as the people at the time could expect, but far less than the vocal radicals wanted. It was a delightful compromise, for a people who had had enough, and a country that had seen what damage revolution had caused abroad. But it had to be fought over and won, in a battle that would be game-changing and would move the country towards universal suffrage, and democracy--a word, as Fraser repeatedly points out, that would strike its audience as sounding somewhat revolutionary. To put things into perspective, Fraser writes that only 439,200 people could vote in 1831, and that rose to 656,000 in 1832--a huge increase of 49%, but still a figure that looks appalling today. Still, it was a tremendous change, that set the path for increased suffrage in the future, and it is Fraser's view that it was a 'great beginning,' if not completely great in itself from today's perspective. So please do experience this book yourself, even if you only have the slightest bit of interest in British politics and its history. The dramatic feel of the story will carry you through it, thinking that not a word is a surplus to requirements. It is short, snappy history, marvellously written, and with not one dull moment. My high school European History teacher, Mr. Ellis, was fond of quoting Macauley--"Reform that you may preserve" (although I recall Mr. Ellis saying "ye"). I've always liked that line; it's short and has a self-evident truth to it. Sure enough, Macauley's line shows up early on in Antonia Fraser's book about the 1832 reform bill. I have to say, that made reading this book worthwhile. This is a very good, nearly blow-by-blow account of the Parliamentary battle over the bill, detailing the debates i My high school European History teacher, Mr. Ellis, was fond of quoting Macauley--"Reform that you may preserve" (although I recall Mr. Ellis saying "ye"). I've always liked that line; it's short and has a self-evident truth to it. 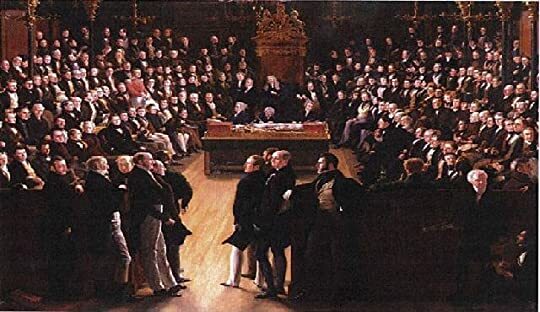 This is a very good, nearly blow-by-blow account of the Parliamentary battle over the bill, detailing the debates in the House of Commons and House of Lords, the political intriguing and the relationship of King William IV with the government. Fraser has a fairly easy writing style, which makes the book eminently readable. This is a stricly narrow political history. What the book doesn't do--and why I don't give it more than three stars--is provide any background or context. Although there are frequent references to unemployment and demands by the people for food, there is no discussion of the economic background or context in which the battle for parliamentary reform was fought, no explanation for why this became such a heated issue. Fraser does not bother to place these events in context at all. A recurring theme of the book as well as of the debates surrounding the bill is that the advocates of reform believed that this was the best way to avoid revolution, and Fraser includes much description of the unrest in England that followed the ups and downs of passage. But she doesn't explain why that unrest existed in the first place. Moreover, even the political aspect of this is pretty bare bones. Fraser spends little time explaining those aspects of the parliamentary electoral system that were targeted for reform and gives very little detail as to what the bill actually did. I came away understanding that the bill did away with at least most if not all of the "rotten boroughs" and gave representation to at least some of the larger cities previously without members of parliament. But there's no real discussion of any other aspects of the reform, such as changes in the requirements for voting. Even in her epilogue, Fraser talks about what happened to some of the major players, but doesn't at all address how the enactment of the reform bill changed the composition of Parliament or the politics of England. A fair and comprehensive account of events leading to the British Reform Bill of 1832. The bill was introduced in Parliament by the Whigs, led by Lord Gray, in March 1831. It was designed to at least reduce the unequitable distribution of Parliamentary seats and to expand the suffrage. Because elective districts had been unchanged for centuries, sparsely inhabited districts had representation while growing towns like Birmingham and Manchester had none. There were the "pocket boroughs" controlled A fair and comprehensive account of events leading to the British Reform Bill of 1832. The bill was introduced in Parliament by the Whigs, led by Lord Gray, in March 1831. It was designed to at least reduce the unequitable distribution of Parliamentary seats and to expand the suffrage. Because elective districts had been unchanged for centuries, sparsely inhabited districts had representation while growing towns like Birmingham and Manchester had none. There were the "pocket boroughs" controlled by the local lord and "rotten boroughs" where votes went to the highest bidder. The bill also lowered the property eligibility requirement for males . Modest as this may seem to us, the fight over reform transfixed English society for over a year. The bill passed the Commons, but was blocked in The House of Lords by the conservative Tories led by the Duke of Wellington. Not yet modern political parties, the Tories and Whigs were both groups of like minded gentlemen led by public minded aristocrats. The Tories believed in maintaining long time institutions and feared popular movements. They pointed to the excesses of the French revolution. The Whigs argued that moderate reform was the best protection against radicalism. At the time England was experiencing the disruptions of the early Industrial Revolution. Poverty and hunger haunted the poor. Violence was directed against the introduction of machinery and against the property of the wealthy. At the same time, the middle class was growing in wealth and confidence and asserting itself. The organization of political unions, especially the Birmingham Union, helped support the bill and were precursors of modern political organizations. Very thoroughly research, this book might be too lengthy for most, who want to know something about The 1832 Reform Act, but not in this detail. At 278 pages, Antonia Fraser has filled the book with fascinating quotes from the time, bringing to life the struggle between those who wanted reform of parliament, and those determined to retain the privileges of the few. Meanwhile, outside of parliament, the country was edging closer and closer to mass revolt. Parliamentarians were not safe in their o Very thoroughly research, this book might be too lengthy for most, who want to know something about The 1832 Reform Act, but not in this detail. At 278 pages, Antonia Fraser has filled the book with fascinating quotes from the time, bringing to life the struggle between those who wanted reform of parliament, and those determined to retain the privileges of the few. Meanwhile, outside of parliament, the country was edging closer and closer to mass revolt. 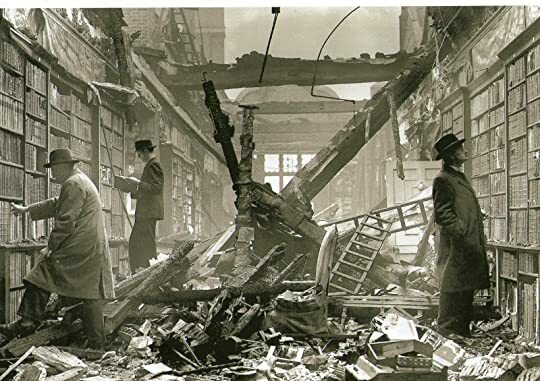 Parliamentarians were not safe in their own houses as the mob smashed windows in their fury at the lack of progress in ridding the country of the Rotten Boroughs and increasing the franchise to include a slightly larger percentage of the population. If you wanted just an overview of these momentous 2 years in parliamentary history, then the 10 pages of the epilogue might suffice for you, but for the rest, don't give up after the first few chapters for the pace of the book picks up, after a slow difficult start, as parliamentary assent gets close. This book provides a partial social history of the time but falls short of commenting much on the dreadful starvation and deprivation under which many people were trying to exist at the time except to note that there had been a series of appalling harvests followed by severe winter weather that “bedevilled” a country already “in the throes of economic distress following the end of the Napoleonic Wars”.”. For that, go to other commentaries, or even "The Life and Adventures of William Cobbett" by Richard Ingrams, for more on determination of the rural poor that something had to change and why the lack of progress almost lead to revolution. As Antonia Fraser says when quoting Cobbett: “I defy you to agitate a fellow with a full stomache”. I hardly ever read non fiction so I'm not the best judge of this particular history book. I thought the nearly 300 pages could have been condensed into a hundred. The parts which documented the wheeling and dealing to get the act through parliament were very good. But the highly detailed descriptions and background of the leading characters (and sometimes their wives and other sundry people) seemed interminable. I guess Antonia Fraser had to fill her book somehow. Her research of the years 1830 I hardly ever read non fiction so I'm not the best judge of this particular history book. I thought the nearly 300 pages could have been condensed into a hundred. The parts which documented the wheeling and dealing to get the act through parliament were very good. But the highly detailed descriptions and background of the leading characters (and sometimes their wives and other sundry people) seemed interminable. I guess Antonia Fraser had to fill her book somehow. Her research of the years 1830 to 1832 is absolutely first class and I just loved the goings on at the Birmingham Political Union. The parts involving King William IV were good especially the influence and power of the monarch in those days. I wanted to know more about the riots and disturbances but I guess these were just as much about the hardship being suffered by the poor than anything else. We then learn about the power of The Lords and how they were able to kick out any Bill they didn't agree with (and they did): "that is to say, the elected Government of a country shouting for Reform - literally in the case of many demonstrators - was unable to bring it about due the action of an unelected Chamber" and later "the debate in the Lords had been an open declaration of war against the people of England". 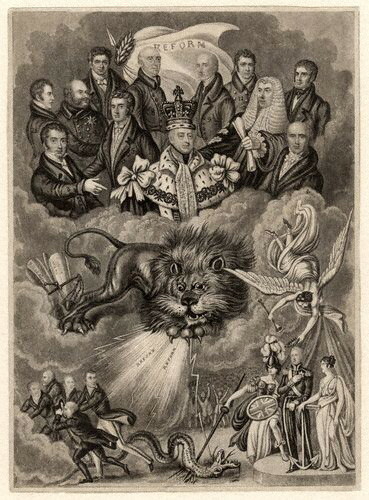 It was only the agreement of the King to a critical device suggested by the Whig government that in the end persuaded The Lords (The Tories holding a majority) to pass the Bill. It made me think that our country has fortunately been continually forming our democracy over a long time. The Lords now do not have that power thank goodness and there have been suggestions of an elected Chamber. And so it goes. Ultimately I enjoyed the book and found it interesting, however it is not well written and often follows aimless bunny trails. The first 4 or 5 chapter took forever to get through - 2 pages of pointless anecdotes or introduction of largely irrelevant personalities of the time were sufficient to put me to sleep or put down the book. It took me 7 months to wade my way through this (and run out of other things I wanted to read). When it actually gets up to the drafting and readings of the bill it sta Ultimately I enjoyed the book and found it interesting, however it is not well written and often follows aimless bunny trails. When it actually gets up to the drafting and readings of the bill it starts to fly. I also found not only was I reading faster and bigger chunks, but I was also skipping/skimming less fluff. The only way to get through this "drama" was to skip the pointlessly dramatic asides and stay to historical facts. And then it ends abruptly in a cloud of fluff about artworks and fails to summarise the later reform bills (which wiki does nicely and only takes about 20 minutes). I would not recommend this book to people - the author no doubt thought herself very clever and witty, but to me it was a 2-3 three chapters of history book spun out needlessly. If you really are interested in Parliamentary Reforms (which is interesting) go to Wikipeadia. very gripping and entertaining account of the atruggle to get the Reform bill passed in 1832. reform was certainly needed, the descriptions of the 'Rotten noroughs are quite extraordinary - one, Old Sarum, consisted simply of a grassy mound and a lump of rock, but it returned two MPs to parliament. lord grey, for the Whigs, fights valiantly for reform, while the Duke of wellington, for the Tories, is equally vigorous in his defense of the status quo. both sides in the debate take very extreme vi very gripping and entertaining account of the atruggle to get the Reform bill passed in 1832. reform was certainly needed, the descriptions of the 'Rotten noroughs are quite extraordinary - one, Old Sarum, consisted simply of a grassy mound and a lump of rock, but it returned two MPs to parliament. lord grey, for the Whigs, fights valiantly for reform, while the Duke of wellington, for the Tories, is equally vigorous in his defense of the status quo. both sides in the debate take very extreme views - the tories prophesying bloody revolution if The reform bill is passed, the Whigs equally certain of bloody revolution if it is not passed. King WIlliam IV, at first in favour of reform, later becomes more cautious, possibly due the influence of his wife, the ultra conservative Queen Adelaide. meanwhile, the king is also trying to fight off attempts to make him live in Buckingham palace - he wants to stay at st. James's. I enjoyed this book as it set a backdrop to the issue of transportation to Australia. The social inequities and imbalance between classes. Also the fact the situation could have very easily turned to violence but was very deftly handled with that view in mind for potential social change. Not a repeat of the situation in France. It would be interesting to see if Antonia Fraser could write something regarding the laws and the treatment of the law breakers of this period and the effects of transport I enjoyed this book as it set a backdrop to the issue of transportation to Australia. The social inequities and imbalance between classes. Also the fact the situation could have very easily turned to violence but was very deftly handled with that view in mind for potential social change. Not a repeat of the situation in France. It would be interesting to see if Antonia Fraser could write something regarding the laws and the treatment of the law breakers of this period and the effects of transportation before and after this Reform Bill. I have read Robert Hughes The Fatal Shore which talks about the Australian part of the picture. Fraser has the rare talent of being able to write about complex historical topics in an accessible way without compromising on research and analysis. We all know a little about the 1832 Reform Act; but this gives us the full story. The personalities involved were crucial, but so was the pressure from "the people", and that is seldom considered. How close was Britain to revolution? We often think that the Act was a small concession to reform, but Fraser brings out just how difficult it was to get Fraser has the rare talent of being able to write about complex historical topics in an accessible way without compromising on research and analysis. We all know a little about the 1832 Reform Act; but this gives us the full story. The personalities involved were crucial, but so was the pressure from "the people", and that is seldom considered. How close was Britain to revolution? We often think that the Act was a small concession to reform, but Fraser brings out just how difficult it was to get even that. Uneven pacing and a somewhat disjointed narrative thread made this book on the Reform Act a bit hard to follow at times. Good use of letters, diaries, and contemporary periodicals (such as satirical broadsides and descriptions of cartoons) to flesh out the spirit of the age, but not necessarily a book that I would recommend as a solid general history of the events of 1832. This was ok. It certainly covers an interesting period of British History, but it did feel rather like I was reading part of Earl Grey's biography. There are long descriptions of the characters and appearances of various aristocrats, and not much in the way of analysis. On top of that, I didn't really get on with Fraser's prose. She has a tendency to write extremely drawn out sentences, meaning the point gets lost about halfway through. I began reading this book to better understand the world of Anthony Trollope. He of course writes a great deal about various reforms in Great Britain. While events in this book take place decades prior to the majority of tropes works, it was still very helpful. It's also a fascinating look at how British society attempted to liberalize and expand the franchise. It read like a fun political thriller, a great credit to Fraser's writing style. I would like to read this book again to not only appreciate its narrative but also to understand how Antonia Fraser constructed, wrote and produced the book. Certainly, I learnt a lot about the 1832 Great Reform Act and there are also interesting parallels with today. A major point I appreciate from a Perilous Question is that democracy is 'in progress' through revolutions and evolutions. Lady Fraser, a gem among modern British popular historians, does her typically brilliant job making what may appear a piece of dusty English social history something vibrant and important. Whether or not Britain faced reform or revolt in 1832 is debatable, happily whether or not Fraser does a brilliant job is not! Antonia Fraser is the author of many widely acclaimed historical works, including the biographies Mary, Queen of Scots (a 40th anniversary edition was published in May 2009), Cromwell: Our Chief of Men, King Charles II and The Gunpowder Plot (CWA Non-Fiction Gold Dagger; St Louis Literary Award). She has written five highly praised books which focus on women in history, The Weaker Vessel: Women's Antonia Fraser is the author of many widely acclaimed historical works, including the biographies Mary, Queen of Scots (a 40th anniversary edition was published in May 2009), Cromwell: Our Chief of Men, King Charles II and The Gunpowder Plot (CWA Non-Fiction Gold Dagger; St Louis Literary Award). She has written five highly praised books which focus on women in history, The Weaker Vessel: Women's Lot in Seventeenth Century Britain (Wolfson Award for History, 1984), The Warrior Queens: Boadecia's Chariot, The Six Wives of Henry VIII, Marie Antoinette: The Journey (Franco-British Literary Prize 2001), which was made into a film by Sofia Coppola in 2006 and most recently Love and Louis XIV: The Women in the Life of the Sun King. She was awarded the Norton Medlicott Medal by the Historical Association in 2000. Antonia Fraser was made DBE in 2011 for her services to literature. Her most recent book is Must You Go?, celebrating her life with Harold Pinter, who died on Christmas Eve 2008. She lives in London.